People all over the world usually equate the Greek Islands with partying and although this is true with some islands, there are others that can be described Family Islands. One such is the Island of Naxos. 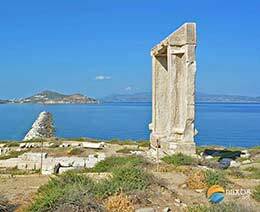 Naxos is a large island, over 400 square kilometres with a great big mountain roughly in the centre so it offers both clean, clear seas and exceptional mountain views. The best way to get around with family is to hire a motorcar. There is no need for a large vehicle since a smaller one will get around the island quite comfortably. As my wife's sister had suggested, I visited Naxos with my wife and 6 year old daughter in early June 2015. The island is truly amazing and, what's most important, it is the best holiday destination for a lively 6 year old who is giving her parents a really hard time. I never thought I would be this relaxed during a holiday. 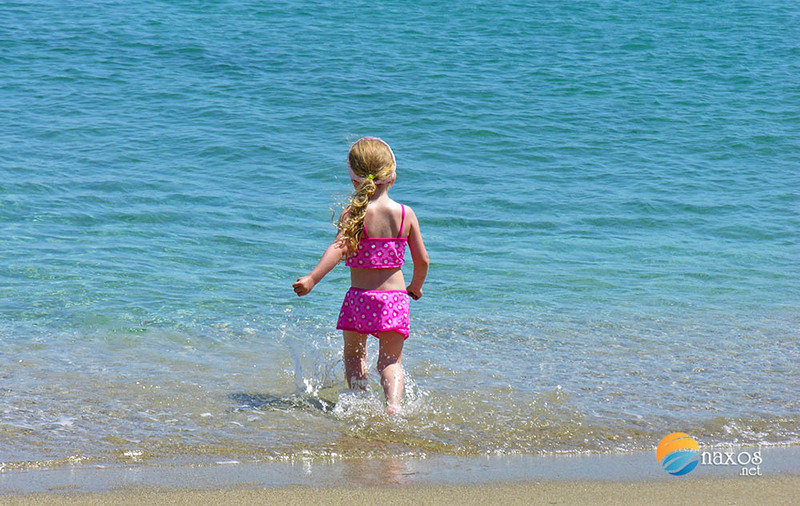 The main concern parents have in any foreign country, apart from having a holiday, is security and safety and Naxos caters to both admirably. There are several village clinics spread across the island and a large hospital in Naxos town. For the little “things and dings”, pharmacies are readily available. 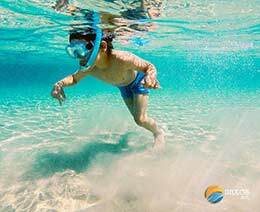 The strong selling point as far as beaches are concerned is that there are two really good beaches for children, shallow and warm, with life-guard and several places to eat on the beach at Saint George (Agios Georgios) and Agia Anna (St. Anna). Although some other beaches are really good as well if you have children in their teens. Another good point is that there are several beach amenities at those beaches. Naxos has over 30 beaches to choose from and, although they are all very good with exceptional water quality, many beaches don’t have life-guards and the winds can make the sea pretty rough for small children and young teenagers alike. Accommodation is varied depending on what each person wants, but it is always good value for money especially just off season. Rooms are usually large, but some accommodations can suffer from small bathrooms, the logic being that one usually does not spend much time there. As far as activities go, there is a wide variety ranging from just touring the island by car from sector to sector each day, to doing nothing but bake in the sun if you so wish. Hiking and biking trails link the various archaeological sites and villages and provide an educational experience as well. This is a big island, so there are many choices and directions to take. It is strongly advised that headgear, drinking water and sun-block are with you at all times. Swimming, in relatively calm and warm seas to the south is quite easy, windsurfing and kite-surfing lessons can be had at the northern coasts where the winds are strong. Renting a sailboat ride for a day is also quite an adventure for all, affording the opportunity to see far more of the island than most people do, including some remote and quite inaccessible by land spots. 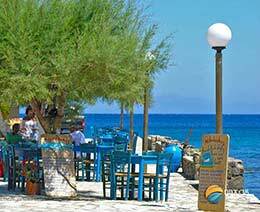 The old town of Naxos describes everything within the castle walls which is a medieval Venetian structure. The narrow alleys lend themselves to exploration and quite a few shopping surprises. At the same time it is a fun educational place for children to experience and there is a museum to top it off. The countryside is dotted with Medieval and post medieval Towers and castles that served as lookouts and fortresses for the surrounding areas and some may be visited to further children’s education of life in those days. Several museums are also housed in these structures around Naxos. Sightseeing at the various archaeological sites is a trip much farther into the past. 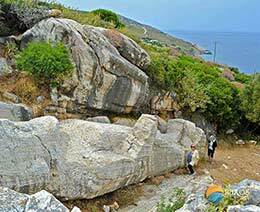 Ancient temples and statues are readily viewed at several spots on the island and are quite impressive due to scale. Naxos produces most of its food on the island, usually on small family plots that often cater to the family run tavern, so you know you’re getting the good stuff! No chemicals or fertilizers here! Naturally the taste of the food is affected by this and the flavours are really intense. Children can be difficult when it comes to food, so simple and flavourful food is readily available, in fact hand cut potato fries made with the famous Naxian potato, is a whole new experience. For the more eclectic, the variety of food available on the island is stunning. 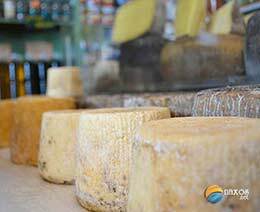 Naxos produces its own meat, poultry, dairy products, wines, sweets, fruit, ouzo, liqueur and a whole lot more. The seafood is usually the catch of the day from a fleet of small family owned trawlers and boats and is exquisite to say the least. Olive oil and salt is all it needs, lemon juice is optional. Naxos is the perfect family holiday island, there’s plenty to do, plenty to see, accommodation is affordable, it’s safe for children, the food is really good value for money and exceptionally tasty and the people are friendly and very helpful.